The original BenchGuard® features a highly absorbent upper surface and a tough polycoated base which contain spills and protect work surfaces. 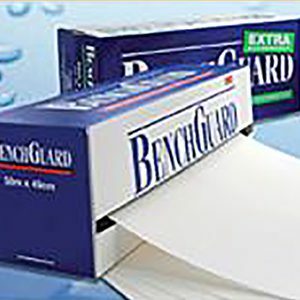 Choose BenchGuard® Extra for twice the absorbency in your most demanding applications. Available in a convenient tear-off roll dispenser or in a box of pre-cut sheets. Tray liners cut to size available on request!